RunningWithScissors is planning to re-do Postal 1 into "Postal Redux", and they confirmed it will be on Linux. The new Postal Redux will use Unreal Engine 4, so it's not surprising Linux is a platform. They have been very supportive of Linux in the past too, so it's great to see them continue this. The only word on release is "2015" right now. We will keep you posted if we hear anything else on it. I am a big fan of Postal 1 due to playing it a lot when I was younger, and it was one of the craziest games around. It will be great to see it revamped completely with nicer controls, as the controls have not aged well. It's great news and all, but Linux is still waiting on all the updates Postal 2 has gained, but RWS did state to us they are working on that themselves now rather than relying on external porter Ryan "Icculus" Gordon. I imagine our editor Hamish will be pretty happy to hear this, and many of you too! The original POSTAL 1 is currently being ported to Android too. POSTAL turned 17 on the 14th of Nov.
Big thanks for keep supporting Linux. 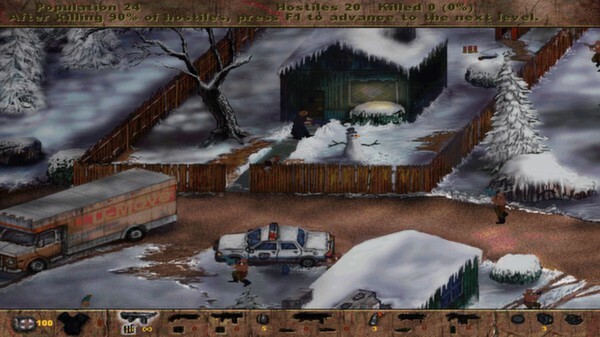 Postal 1 never worked in my case, I killed everyone and then I couldn't access to any map Thats was annoying, because I tried several times on linux and windows. I hope this UE4 port will finally work properly. Isn't UE4 a bit overpowered for a 2D game? Or will they re-do it with 3D graphics? edo Postal 1 never worked in my case, I killed everyone and then I couldn't access to any map Thats was annoying, because I tried several times on linux and windows. And when it comes to using UE4 for the game, considering the fact that all of the developers at RWS are now familiar with using UnrealScript and have extensive experience with the Unreal tools, not to mention the need for proper cross-platform support, I can see why UE4 would be very attractive for them. Great info, thanks. btw this doesnt have any sense. I guess I will have to play it again. Yeah, using UE4 is more about ease of portability to as many platforms as possible, Linux especially.